A Man With A Ph.D. :- A lot of heat is going into the ocean | Dare I Call These People Alarmists? This guy cannot seem to either comprehend or deign to answer my quite reasonable question and tries to side track me. Another alarmist who cannot defend his beliefs but hates to admit it. You see awfully sure about that. Would you care to share with me and the readers any empirical evidence you have that supports that statement? September 30, 2010 at 9:53 pm I believe this page at Skeptical Science may help you understand why without the greenhouse effect the Earth’s surface would be much colder. Yes I have studied Skeptical Science very carefully and have found it contains no empirical evidence supporting the “anthropogenic CO2 causes Global Warming” hypothesis. Skeptical science relies on a number of observations and correlations. The problem with this is two fold: 1. Many of the correlations have been “observed” using models that assume the above hypothesis, and 2. (and I dont know what you studied in your PhD) but every freshman in statistics knows that correlation is not any sort of proof of causation. Having said that, I am always keen to examine any empirical proof if you have it. Moving the goalposts is not a way to deal with the fascinating world around us nor for engaging people in a worthwhile discussion. There are a lot of other places to see the data about the greenhouse effect if Skeptical Science does not suit your sensibilities. Somehow, I do not think that is what you really seek. I am curious why you believe that statistics is involved in the the wavelengths of light that are absorbed by CO2? Causation and correlation do not appear to have anything to do with the physical characteristics of CO2. I answered you request. If you chose to change the subject rather than address the issue in any sort of relevant fashion. then perhaps there is no real opportunity to have a discussion. October 1, 2010 at 12:50 am With all due respect, I did state that I was very familiar with the skeptical science site. Also I think you are muddling the issue some. I never and I do not deny the greenhouse properties of CO2 or of water vapour for that matter, but in your blog, you are the one asserting ” Greenhouse gases in the atmosphere, such as carbon dioxide, cause heating of the Earth.” by which it is reasonable to interpret that you mean is causing or has caused the current warming of the earth. My question is, and I repeat, Do you have any empirical evidence that this is the case. NOAA stated “Greenhouse gases in the atmosphere, such as carbon dioxide, cause heating of the Earth” in the section I quoted. You asked where the evidence was for that. I showed you the data. I know these sorts of conversations can be hard so I’m sorry if anything I wrote came across as harsh. It’s after 1 am here and I may not be as coherent as normal. It seems you now want me to prove whether AGW is true or provide empirical evidence it is. If that is what you want, there are plenty of very good sites on the Web that can help you with that. I don’t really have the time or responsibility to educate you about AGW. If you completely ignore a site that provides good basic explanations/with comments and links to the data, your task will be harder. For me, AGW provides the best model to explain all the data that has been generated. Just as evolution and natural selection is the best model for the diversity of life. As I am sure you know, science does that until a better model comes along that has better explanatory power. We can only work to get the best data possible and generate the best scientific models of the Natural World. At the moment, the best model I know of to explain the changes we see today is AGW. So if I showed you a better model you would change your mind? If you have a better model, you are going to be a very famous man. You have told me the following. 2. This is your solid conviction because in keeping with the majority of your replies, you have tried to steer clear of the points I have been asserting. Your last comment says to me that no matter what I or anyone else tells you, there IS global warming and it IS caused the CO2 emissions of our civilization. And yet you cannot explain to me any evidence at all, and you either do not know what empirical evidence is, or it is too painful for you to go there. What is your PhD in then? Politics? Anyway it is obvious from our conversation that you have very little to base your beliefs on, but you spend this time promoting these theories as truth and fact. How do you sleep at night? I have an open mind, I have questioned many self promoted “experts” such as yourself, but never got a sensible answer. I am sure you know but are unwilling to discuss that there are a number of alternative models or hypothesis’ which describe the current conditions very well. One hypothesis I like which is described in my blog, has a number of irrefutable supporting factors which make it very much more likely than the current “anthropogenic CO2 causes Global Warming” hypothesis and these facts disprove the “anthropogenic CO2 causes Global Warming” hypothesis. Needless to say the hypothesis in my blog is not peculiar to me but shared by most people who have used their minds to consider the facts and are able to see through the political and paparazzi cloud. I checked out your website and did not find anything there that presents a better model than AGW does– not one I found convincing in the least. Doing that requires more than throwing brickbats at AGW. Your model seems to be mainly denying warming is occurring at all. Sorry, I do not find that the data support that interpretation. As I said, it is not my responsibility to try and convince you. You either can look at the wide range of data examining this question that have been produced over the last 50 years or you can find ways to ignore them. It appears to me that you have decided to do the latter. If so, then I really see no need for us to engage each other again. Just as I’d not waste time trying to convince a Young Earth Creationist that the Earth is more than 10,000 years old and that humans and Apes share a common ancestor, I’ll not waste time convincing an AGW-denialist that the Earth is warming. The reason for these comments has been to check the depth of your convictions, seeing as how you seem to be happy to parade and prosletize your beliefs in the public arena. I am sorry to say that you appear to have little foundation for your beliefs as now you are avoiding the question by attacking my person. Perhaps you should give me and the readers at least one good reason why we should attach any validity at all to what YOU write. PS Where abouts in my website do I deny global warming? I do not recall that at all. Maybe you should actually read my site before you comment about it. Of course it will be painful to read because it points out facts that conflict with your beliefs. I have also reproduced this conversation at http://www.globalwarmingsupporter.wordpress.com where my readers will also be interested to evaluate your responses. I’m am replying one more time since you have stated that you are reproducing this conversation for others. I do not want them to think I am rude. 1) Sorry. I left out a word. You site seems to be mainly denying anthropogenic global warming. I don’t always proof comments as well as I should. 2) I would suggest that your previous comment (at 8:15 PM) contained a fair amount of personal attack. 3) I answered your initial question by pointing you to a website. I’ll try one more time but I have little hope it will alter anything because I’m sure you have seen that data before. 4) As I said before, science is about finding and using data to create a model that best describes the world around us. I am satisfied that AGW does just that and that, at the moment, there is no other model that does better. Thus I will continue to write about data and research that help us understand the world better by helping create better models. So far, those data support AGW. 5) I have waited for you to inform me of a better model. Your website failed to present any convincing data (at least to me) of a better model than AGW – both in its explanatory power of what we have seen and also in its predictive power to point us in the direction of further research. Perhaps I missed that part because so much of the page was devoted to throwing things at the AGW edifice. MWP and Greenland are possible arguments against a very small part of AGW, although ultimately those arguments are unconvincing and fail because the data do not support their relevance to global climate. 6) What do you call your model that replaces AGW, that explains ocean acidification, carbon isotope ratios, oxygen levels, CO2 increases, greater temperature increases at high latitudes, sea level rises, increasing ocean temperatures, arctic ice volume lose, increasing night time temperatures and a lot more? 7) If you do have a better model than AGW, what sorts of experiments could be done to differentiate between your model and AGW? Because one has to be a better representation of the world than the other. People have been trying to do this for over 20 years and failed. It really would be cool if you could succeed. 8) Having been part of Usenet wars about all sorts of science topics, I had a pretty good idea of how this could have proceeded. I have tried to respond civilly and only got snarky when I felt you did first. If I misread your intentions from previous comments, accept my apologies. 9) Unless you can see some way for us to have a meeting of the minds, this will be my last reply. We may just have to disagree. Yes adding that little word “anthropogenic” does alter what you say considerably. I have to say, although privately I think many of the above observations have their problems, that once again you have read something into my site, and therefore into my reasoning, that is not there. I have not attacked these observations, but what I do vigorously attack is the way politicians, websites and commentators such as you, consider that these observations constitute proof in any shape or form. The fact that the world has been warmer than the present many times before, (a number of those times within history), severely disproves any causation attributed to CO2 to a reasonable mind. The only arguments I have seen to counter that, have been attempts to change history. Until some evidence of causation comes to hand, which you certainly have not mentioned, why should we ruin our economies and life styles on the account of prophets who tell us that we are going to burn up the world? So far you have steadfastly refused to demonstrate any personal reasoning of your own. Are you paid by someone to express their official line perhaps? Instead of relying on what politicians and political organisations say, which is what you are doing when you refer me to skeptical science, how about sharing with us, YOUR reasoning on the matter. If you want to rely on “faith” well share that fact with us as well. I’m sorry if I somehow misconstrued your reasoning. I’ve asked you to tell me what your model is and how it differs from AGW several times now. Could you please provide a short explanation? I am familiar with models from my economics days. However they are useful only when you have properly known parameters, or trying to find parameters to produce a known result. So I do not have one of those. However we do have some facts to work from. What we do know is that the world regularly warms and cools, we can theorise why, but that is not important really, what is important that it does this independantly from CO2 concentrations. Now at least three major warmings have occurred in historical times. During the first one of these, the holocene maximum, we know that the Sahara was fertile and stone age man used the pass at Schnidejoch. During the Roman Warming we know that Climate was also warmer than today as roman remains are also appearing from under the glacier at Schnidejoch. And there are numerous proxies which record similar evidence from Greenland Ice Cores, Antarctic Ice Cores, studies in New Zealand, Pacific Warm Pool and China just to name a few. (links are in my blog). We also know there were cooler periods between such as the little ice age etc well recorded in european history and responsible for the most recent advancing of many glaciers. This graph is very authorative and indicative of the temperatures during the periods I have mentioned. 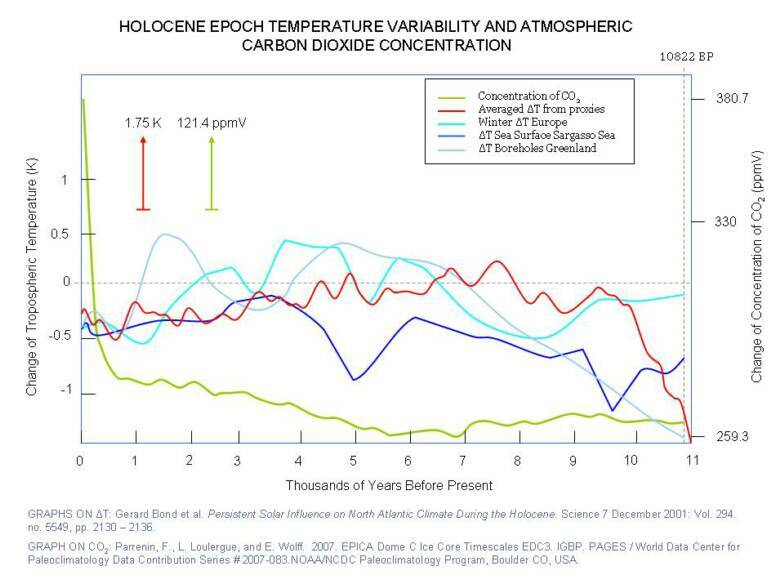 These fluctuations at times when there was very little or no anthropogenic CO2, disprove the “anthropogenic CO2 causes Global Warming” hypothesis. 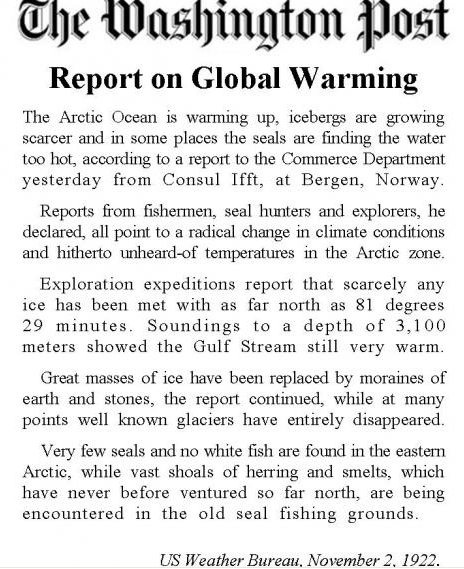 To prove that the current warming is this time caused by Anthropogenic CO2 not only needs a lot more direct proof of causation but also proof that the warming mechanism of previous warmings is NOT responsible. To be quite frank, there is no scientific paper or commentary that I have read that can claim the above has been done. That is my thinking, and as I have touched on previously, the economic suicide that the IPCC is promoting for western countries makes it very necessary that we do not go down the carbon dioxide reduction road lightly. Disagree if you like, but on my blog you will find facts that support everyone of those assertions.